What a show! This tribute band wowed the audience composed of us seniors who were Beatles' fans in the 1960s and the young, our children and grandchildren who never saw the Beatles. Led by Tony Kishman (Paul McCartney) we were all singing and waving Hey Jude! in the encore number. And to boot, there was another encore number where we all participated, singing and almost dancing in the aisles! Imagine The Beatles playing in concert with the VSO. What a treat! And speaking of Imagine, the signature song of John Lennon (Jim Owen) who was dressed all in white--he was juat like the original John Lennon, playing the piano and rendering this memorable song. Even the other two Chris Camilleri (Ringo Starr) on drums and David John (George Harrison) who did a marvelous job playing lead guitar, did their own solos. 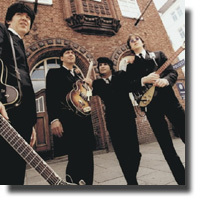 These four American musicians looked and sounded and their show just like The Beatles. They presented around 30 Beatles tunes sung, played, and performed exactly as they were written. a symphony orchestra. Martin Herman, who transcribed the musical scores note for note from Beatles recordings did a marvelous job. Maestro Gordon Gerrard conducted with finesse as the VSO accompanied these fabulous four.-- "Penny Lane" with a live trumpet section;"Yesterday", mixing McArthy's acoustic guitar with VSO's string quartet; and the rock/classical blend on the hard edged Lennon classic "I Am the Walrus". What an incredible simulation from this fantastic band who came to commemorate the 50th Anniversary of The Beatles’ landmark concert at Empire Stadium here in Vancouver!